These handout photos show some of Las Vegas' famous neon signs, which no longer work, lit up once again. The Neon Museum is using augmented reality technology to bring them back to life in its "Brilliant!" exhibit. As Frank Sinatra asks Lady Luck to stick around, the neon red lights of one of Las Vegas' most famous towering signs appear to dance under the night sky, revealing a beating heart and the rest of the marquee of a famed casino-hotel. Other rusted, dusted and broken neon signs in a large gravel lot ringed by a security wall appear to light up with neon not seen for decades as other classic tunes play in the background. But these former landmarks of Sin City are missing light bulbs and some of the remaining are cracked or hang by a wire. They have not being restored and are not plugged to a power outlet. Augmented reality tests last week made it look like many of the city's famed neon signs are burning brightly again. 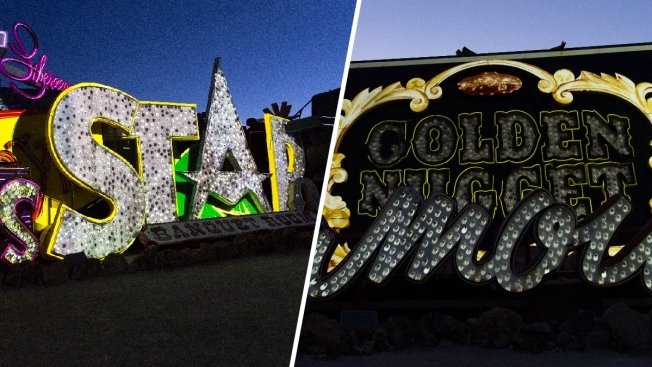 Forty neon signs that once drew visitors to some of Las Vegas' most iconic casino-hotels and other venues will shine again for the public starting Thursday night at the Neon Museum, but not a single one of their lights will truly be on. The unrestored marquees, worn by the beating sun and twisted by desert winds, are being brought back to life thanks to projection mapping, a type of augmented reality created by projecting life-like digital animations of the signs onto the hulking metal. "We are combining art, history and technology in this space," said Neon Museum president and chief executive officer Rob McCoy. He added: "This is Las Vegas as it was. It is very emotional. Even people who don't live here, but live around the United States or around the world, they all have in their heads a romantic image of Las Vegas, and it's usually that vintage, neon Las Vegas." The signs on display include the Golden Nugget, Lady Luck, Binion's Horseshoe and the first four futuristic-looking letters of the Stardust because the sign at the museum is missing the "dust" part of it. The 30-minute immersive experience presented after sunset allows visitors to walk freely around the outdoor gallery and get close to the signs. A soundtrack that includes Elvis Presley's "Night Life," ''Mr. Sandman" by The Chordettes and Ella Fitzgerald's "I'm Beginning to See The Light" plays in tandem with each sign that is illuminated. "There are moments here where there's no bulb, but I've created a digital bulb that is in its place," Winslow said. "From far away it just looks like the sign is lit. You get up closer, and you realize all these are broken or there are missing bulbs or hanging bulbs." As the Binion's horseshoe flickers in shades of gold and red, Dean Martin croons "I Love Vegas." Meanwhile, Presley's "Viva Las Vegas" blasts as the set of the Stardust letters shine. "Whether they come by car, rail or circle the city and dropping by plane, their eyes pop wide open with their first glimpse of Las Vegas," a historical narration plays right before the signs begin to light up. "A city whose head is wreathed in garlands of neon signs, and a city of storybook west."